Saturday. Buoyed by Scotland’s unlikely win against England in the rugby this afternoon, a jubilant D has volunteered to make us a celebratory pizza for tonight’s dinner. His last attempt, though very tasty, was a bit doughy and heavy. Can he perfect it tonight? 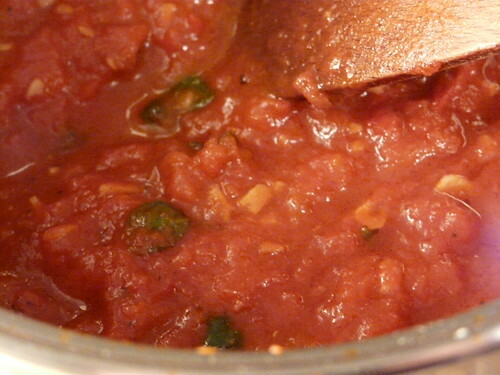 17:30 – He’s making the sauce and garlicky aromas are wafting through the house. Now, this part was absolutely perfect last time. In fact, I thought his tomato sauce was better than the version that I’ve been making for years and it’s far simpler to make. Warm the oil in a small pan over a medium low heat. Add the garlic and fry gently until starting to turn golden. Add the chopped tomatoes and basil leaves. Stir well and simmer gently for 30 minutes. 18:00 – Sauce is ready and I got to taste it. Yummy. 18:03 – My kitchen is trembling. He’s about to make the dough. The work surfaces are still raw from being scrubbed to a flour free state (by me, can I add) last time pizza dough was made. 18:05 – D has just shouted at me for repeatedly calling out “What are you doing now?” Apparently it’s distracting. Wonder how he’s going to react when I start taking pictures? D is following a recipe identical to the one found here. For visual instructions, click here. 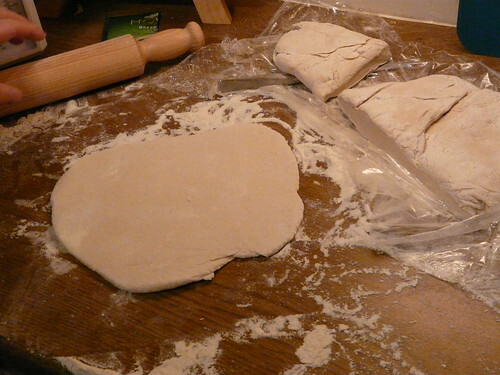 18:24 – The dough is coming together nicely. D appears to be mellowing as he has not reacted at all to me hovering around with my camera. 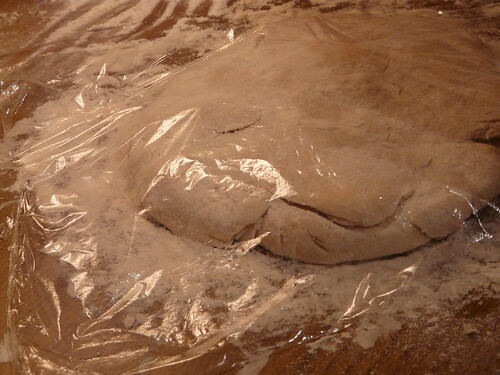 18:30 – The dough is resting. D is covered in flour and is leaving a trail of white powder wherever he goes. 18:50 – Oven’s on. 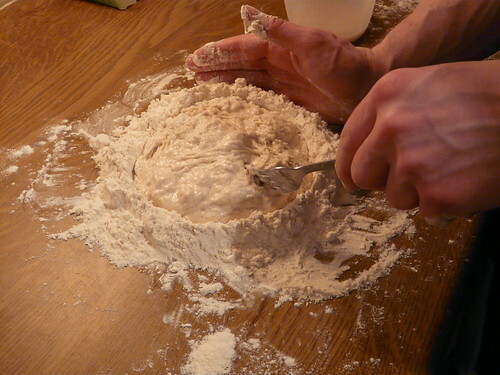 Dough’s being rolled. Toppings are chopped. 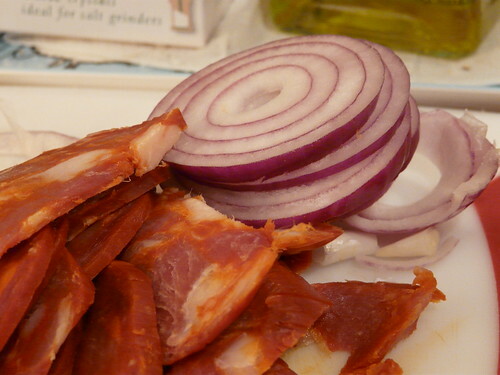 Tonight we’re having chorizo, red onion and mozzarella. 18:55 – Oh, it’s all looking wonderful. I’m starving. 19:05 – Disaster has struck. One pizza went in the oven, no problem. The second, which is D’s, stuck to the work surface. Our attempts to move it have resulted in a mangled mess. It’s in the oven anyway. 19:20 – Time to eat! 20:00 – Both pizzas tasted fantastic. 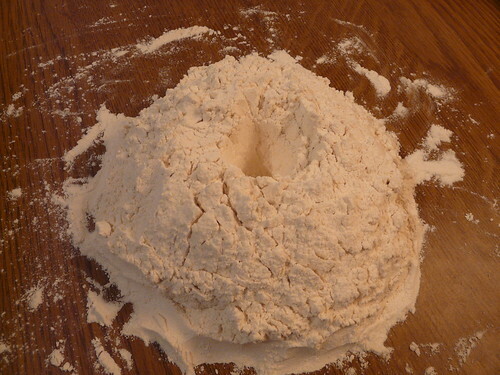 I’m stuffed and the kitchen is covered in flour. It’s going to have to stay that way until tomorrow as we’re off to the pub. Great post, Wendy! I always love to hear about the ‘disasters’ as well as the successes in the kitchen – most reassuring. I still think that second pizza looks pretty good though and I bet it tasted delicious! Travesty never looked so good as a pizza! They look great 😀 I love homemade pizza. LOL! Who got the honor of eating the ummmm….not so pretty pizza? Red onions on pizza are my favorite. Can’t wait until tomatoes are in season. There is nothing like fresh basil, red onions, and fresh tomatoes! Way to go D !!! They look great and tasty and have the perfect toppings! At least with photo number 2 we know you did not cheat and photo a store bought pizza 🙂 It looks very rustic! Probably tasted better than the first one! Well done! Now I am craving home made pizza! It is always the best! That was a great post! I was there with you! 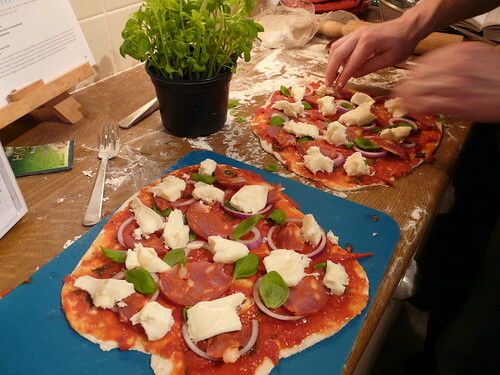 I have been involved with pizzas like the second one, much swearing ensued! I’m not giggling at the 2nd pizza – I am giggling at the ‘small boys in the park, jumpers for goal posts’ style commentary. (I assume you have seen the Fast Show). Great post! I’m sure they both tasted great! Next time, you might try putting each pizza on a piece of lightly floured parchment paper and transferring it, paper and all, onto the baking tray. I have serious pizza cravings now and I blame you! They look so good. I bet the second one tasted as great as the first although it didn’t look so great. Top marks for nabbing the intact one for yourself! Antonia – I like to hear about disasters too. Tend to get grumpy when they happen to me though! Joel – Ah, silpat looks like a handy item in the kitchen. Claire – Thanks from D! 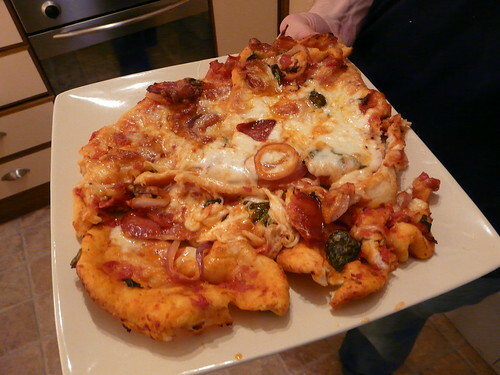 Deb – I’m not usually that fussed about pizza but these were really great! Maninas – D is a chorizo addict. Chorizo with everything! Holler – Yes, the language was a bit blue that night. Helen – It was luck, actually. I had less cheese and more onion on mine and we put it into the oven first. By the time we got to putting the second pizza in the oven it had attached itself to the surface. I hate it when I put a pizza in the oven and all the topping falls off. Your pizzas look delicious. I’m sure it was all a lot of fun too. I admire you for posting about both pizzas. Yes, I was rather chuffed that Scotland won, too. Pizza is a great celebratory meal. Hilarious! But not laughing at D. Am just thinking about how the boys around here would cope if I put the camera on them while they made pizza…he he. 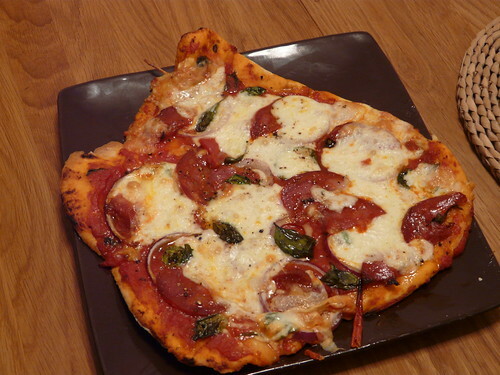 Those pizza look amazing, yet another one of your blog entries on my list of things to cook! Sara – It’s even worse when it falls onto the bottom of the oven and burns. I hate cleaning the oven! Lucy – D was partly incredulous and partly irritated. Now, he loves to see all the comments though. Mike – Thank you! Let me know how you get on! Homemade pizza night is a favourite in this house. And your ones look sensational. I think I’ll give that sauce and dough a try – looks good! I appreciate that a lot of your recipes use simple ingredients. Great blog! Kim – Thank you! It’s fast becoming a favourite here too. You know when you a read a post, step by step and get hungrier and hungrier – this is what happened with your pizzas. My kids love making pizzas and its a great way of helping the more nervous veg-haters.